Before and After - The Bar. A few moments inside my head upon truly getting to see our new home for the first time after a lightning quick "showing-offer-bidding competition-accepted" situation... "This kitchen has 2 ovens!!! Wait. What is that? That isn't an oven is it? Is that a microwave? Is this the movie set for Sixteen Candles? Can we get rid of that oven? What I would really like is a little bar area? Like a little Butler's Pantry. Maybe a book-case, a place for drinks, and beer. Y'know, something I would actually use. Definitely not that microwave. I think I will donate it to the Indiana Historical Society." So,we talked to our trim carpenter, Jerry Sawyer. Even though he already gave us a great quote and has an amazing reputation, I had to definitely say yes when Baby Girl let him hold her and she smiled. This is opposed to her usual reaction to, well, pretty much everybody... ferocious screaming. With the stealth of a professional jigsaw artist, Jerry had dreamed up a plan and before we knew it, kitchen demo was under way. The microwave and oven was removed. A book-case was put in its place. Bo, our painter patched the drywall. 'Yours truly' removed the glorious linoleum flooring that lines every. single. shelf. in the entire kitchen. After a good 20 minutes hacking away at the top shelf linoleum with a putty knife, I decided that the tiles throughout the rest of the kitchen cabinets would remain and be hidden beneath new shelf liner paper. I had run out of elbow grease. Next came new counter tops. New wall and cabinet paint(more on all these transformations later). 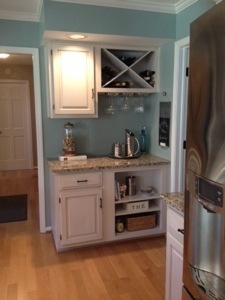 And to complete my vision, Jerry made a wine rack to fill the vacant top cabinet and hung stemware. Voila! A new bar/butler's pantry! Complete with a bookcase full of breakable decor items for Baby Girl to destroy. As long as she doesn't hurt my "Chinese Lucky Cat", (Maneki-neko) from my days working for PF Changs. It has brought much luck to me in 6 kitchens across the country. We pray this is the cucina where it retires.